Joachim Brohm (Dülken, Germany, 1955). Has a Diploma in Visual Comunications/Photography from the University of Essen GHS/Folkwang (Germany, 1983) and at the Ohio State University in Columbus (USA, 1984). He has had many solo exhibitions all around the world: Germany, Holland, Austria, USA, Italy, Czech Republic, Belgium, UK, China and Portugal. He was Lecturer and Visiting Artist/Professor in Bielefeld, Dortmund, Salzburg, Chicago and Zürich. Since 1993 he is Professor of Photography at the Academy of Visual Arts in Leipzig where he was also Rector from 2003 to 2011. Has had several monographs as well as been part of many catalogues of group exhibitions. Lives and works in Leipzig. 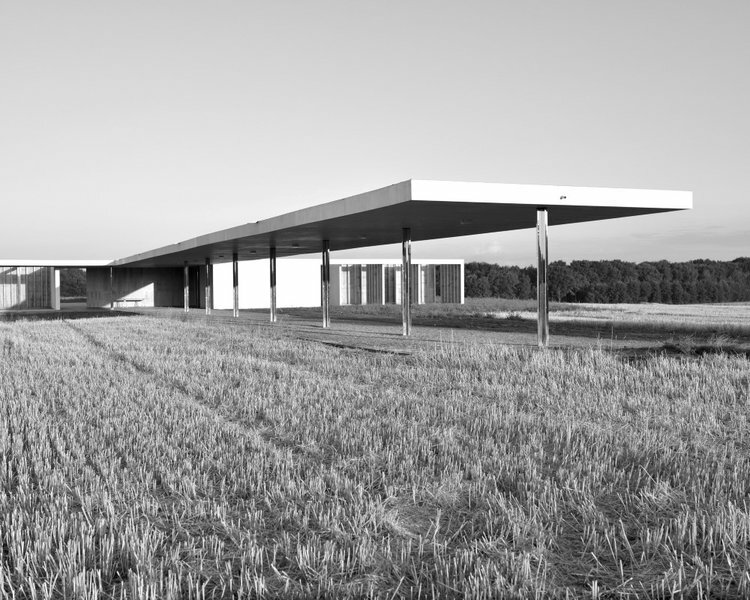 More than 80 years after (Mies van der Rohes) designs for the Krefeld Golf Club were abandoned due to the Great Depression, Belgian architect Paul Robbrecht set about to realize the unfinished project. 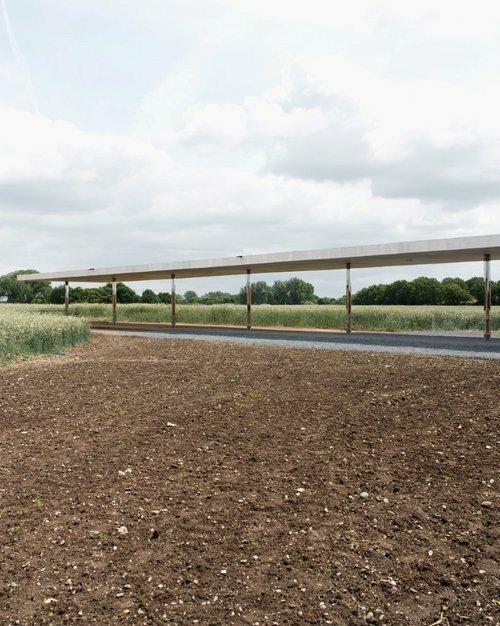 In 2013, a 1:1 scale model of Mies van der Rohe's original design was realized on the outskirts of Krefeld, a location Mies had selected. Built from unfinished drawings and unrefined plans, the space was rough and incomplete. The temporary space provided rare insight into what could have been – a notion that intrigued photographer Joachim Brohm, and is emphasized by his photographs which draw on the style of the original Modernist photographers, using a mixture of color and black and white images which incorporate diagonal lines and emphasize the open, flowing spaces of the Mies design. Brohm has an extensive background in architectural photography. His portfolio of architectural eccentricities delves into the details of design anomalies, drawing attention to uncommon elements of building design. Brohm was given the opportunity to photograph the life-size Mies model, producing a series of photographs that examine the basic geometry of architectural design, with an emphasis on the unfinished elements of the building.